Kris grew up in the Seattle area. After graduating from the University of Washington in 1988, she attended law school at Marquette Law School in Milwaukee, Wisconsin, and obtained a Juris Doctorate in 1991. 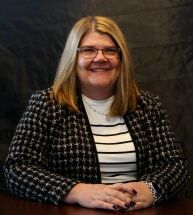 ​Kris began practicing law in Lansing, Michigan, but returned back to Wisconsin in 1994 and began growing her family practice. In 1997, she helped form the law firm of Brazil, Thelen & Benske, S.C. When the firm decided to take alternate paths, the law firm of Thelen & Associates, LLC was launched. Kris practices in all of the courts of Southeastern Wisconsin handling all family law matters, including child support, custody, placement and visitation. She also handles cases involving alimony (maintenance), property division, pre-nuptials/ante-nuptial agreements and cohabitation. She has also handled numerous matters before the Wisconsin Court of Appeals and the Wisconsin Supreme Court. Kris is a member of the family sections of the Wisconsin Bar Association, the Waukesha County Bar Association, Society of Family Lawyers and Wisconsin Association of Mediators. She was also named a "Wisconsin Super Lawyer" in an evaluation by her peers. Kris, her husband and five kids live in Waukesha County. She enjoys kids sports, camping and family time.